I designed this quilt on graph paper, and that was the easy part. I've never made this triple sashing with the 9P cornerstones till now. 1. What is this design called in general. Not necessarily a specific pattern name but this type of sashing. 2. If you have made this type, what did you do for the outside edges before binding? A narrow border of different fabric? No border, just binding? That looks nice - it never occurred to me to do that with different sized blocks! I have some green leafy tone on tone fabric. Do you think that would work for outer border and binding? Or is solid color better? Geri B, do you have a photo of the one you did? 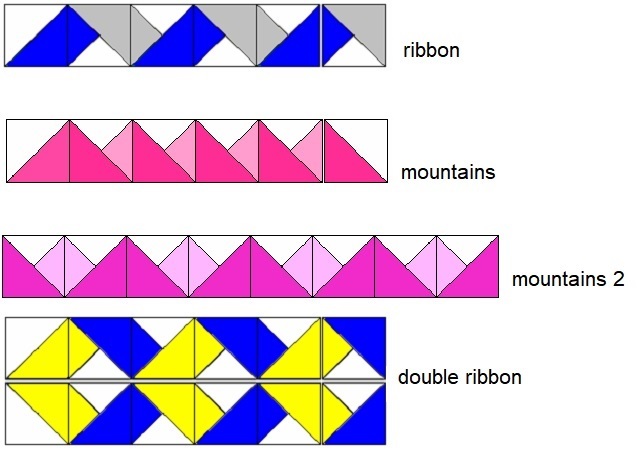 I would refer to that as sashing strips with cornerstones made up of 9 patches. I've also made a couple with a friendship star in the cornerstones. Can't find a photo of that one, but did something similar. Border about the same width as the sashing, used the accent fabric. Don't know if there's an official name. 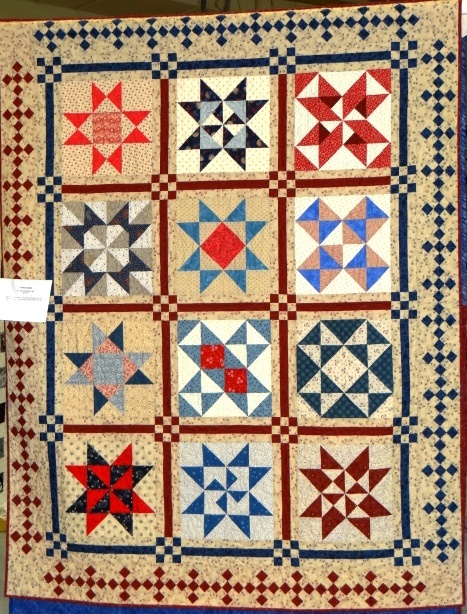 I've heard it referred to as pieced sashing with <9 patch> cornerstones. Here's one I did with this sashing. I used 9 patches on point as an outer border. Jan in VA, I totally love the 9P on point border! I can't use it this time, the quilt is already too big. LOL But I will use it sometime, for sure. All of the shown pics are beautiful. Linda, I think your quilt is beautiful. I would do the sashing on the sides and the tone on tone green should be perfect. Linda....your quilt is gorgeous. Jennie at MSQC did a sashing ideas tutorial and this was one of them. I don't recall if there was a pattern name for it. Here's the link and, as you can see, your sashing is on the quilt behind her. And, green would be perfect. Jan... Your quilt rocks, girl. That is beautiful! .....Jan... Your quilt rocks, girl. That is beautiful! Thank you, Teen. It is one of my favorites. I designed the quilt. The blocks were from a Block of the Month I ran for our local guild one year with patterns I wrote. 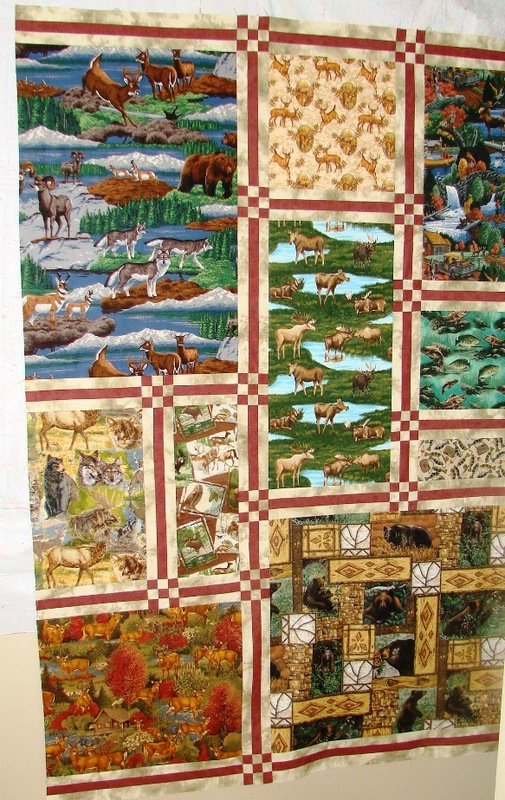 It took a while for me to put the quilt together when the BOM was done, I let it be a WIP for a couple of years. I discovered the 9 patch border, even on point, didn't quite fit the quilt, but that is always just an opportunity for design options for me and is the reason I made the different and blue sides. Isn't it interesting how changing the color or the orientation of a block can change the whole look of a quilt?! One of my favorites to do that with is what I call a tri-square triangle (like a half square triangle but with 3 triangles in it). Think of the different ways that can be colored and then what you can do with those squares! Here are a few examples I've drawn.